The Discussion by Ralph Tarzian needed some TLC as bird droppings had stained and etched the bronze. Sculptures, murals and other public art—both new and newly restored—help make Laguna Beach a vibrant place to explore. As locals and visitors know, Laguna Beach is home to dozens of art galleries filled with all manner of mediums and styles: impressionist paintings, modern sculptures, landscape photos and even early works by some of the painters that helped establish Laguna as an artist colony. And, while walking from one exhibit space to the next, it becomes obvious that you are already in a gallery of sorts; the town’s public art does as much to define Laguna’s character today as its arts heritage dating all the way back to its first resident painter, Norman St. Clair, who settled here in 1903. Laguna has since made a name for itself in the public art arena, now boasting more than 80 pieces scattered around town. 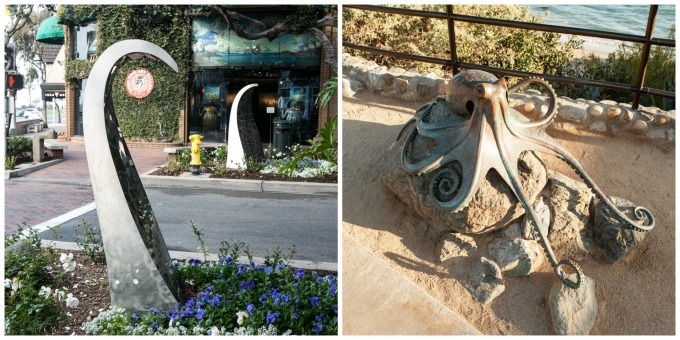 Everything from sculptures prominently displayed near beaches and green space to those carefully camouflaged as part of the coastal landscape, public art has become part of the fabric that makes Laguna more than just another California beach town. Two city programs—Art in Public Places as well as Public Art and Murals—ensure that installing high-quality, diverse public art remains a priority. The goal is to reflect the city and its residents. Under a city ordinance, developers must install a piece of public art or pay an in-lieu fee toward public artwork for any new building construction—and some renovation projects—valued at more than $225,000. 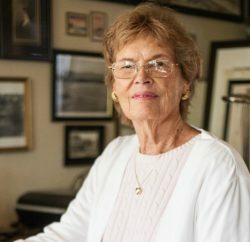 “As an arts colony, public art defines our aspiration and qualities as a community,” says Sian Poeschl, cultural arts manager for the city of Laguna Beach. The city is also defined by its proximity to the ocean, a setting that can take a toll on outdoor artwork. 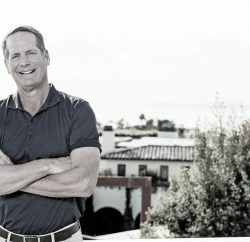 Over time, Laguna’s natural coastal environment has created problems for some of the public art pieces on display throughout the community, as metal corrodes up to 10 times faster in salty ocean air than it does in places with normal humidity. And the organic material found in sea spray contains bacteria that can disrupt outdoor surfaces, too. In response to these factors, for the 2017 to 2018 fiscal year, the city budgeted $25,000 for ongoing restorations to repair damaged artwork. More than a dozen public art pieces have been restored over the past couple of years. Some receive a quick fix; for others, it’s a phased approach and a restoration process that requires a patient and delicate touch. [Left to right:] North and South Waves by Larry Gill was cleaned and sealed last year to keep it looking bright. The Tide Pool by Casey Parlette was added in 2017. Boy and Dog, created in 1933 by Ruth Peabody, is the oldest sculpture in the city’s public art collection and yet, this local landmark is still standing thanks to periodic maintenance. The multifunctional piece is located in Jahraus Park at Cliff Drive and North Coast Highway, and allows dogs a drink from its lower pool, but was in need of some attention a few years ago. It was caringly restored by artist Cheryl Ekstrom before she passed away, and replacement of the boy’s arm was funded in part by Laguna Beach resident Mark Porterfield in 2008. Today, dogs and their human companions continue to enjoy the piece and cooling off at its dog watering bowl on hot summer days. With the ever-present coastal effects of sun, wind and salty air, and occasional vandalism, local artists—along with Poeschl and her team—have their work cut out for them. Many restorations include a time-consuming process of not only refinishing and refurbishing, but also taking steps to prevent future damage. [Left to right:] Deer Warrior by Cheryl Ekstrom. Boy and Dog by Ruth Peabody is the citys oldest public art sculpture. The Shopper by Andrew Myers. For example, North and South Waves, installed in 2003 at South Coast Highway and Forest Avenue by artist Larry Gill, needed repairs to the stainless steel and green granite tile. These prominent pieces were showing wear and tear: Grime and dirt buildup had caused oxidation on the stainless steel while the granite inset also needed a thorough cleaning. To treat the wave sculptures last year, the stainless steel exterior was buffed out by hand to retain the existing finish. Additionally, CitriSurf 77, a product used for the cleaning and passivation (removing free iron and other contaminants), was applied to brighten the stainless steel’s finish, and the granite was cleansed. A sealant was then applied, leaving a gleaming, visibly brighter and polished work of art for a restoration cost of $2,200. 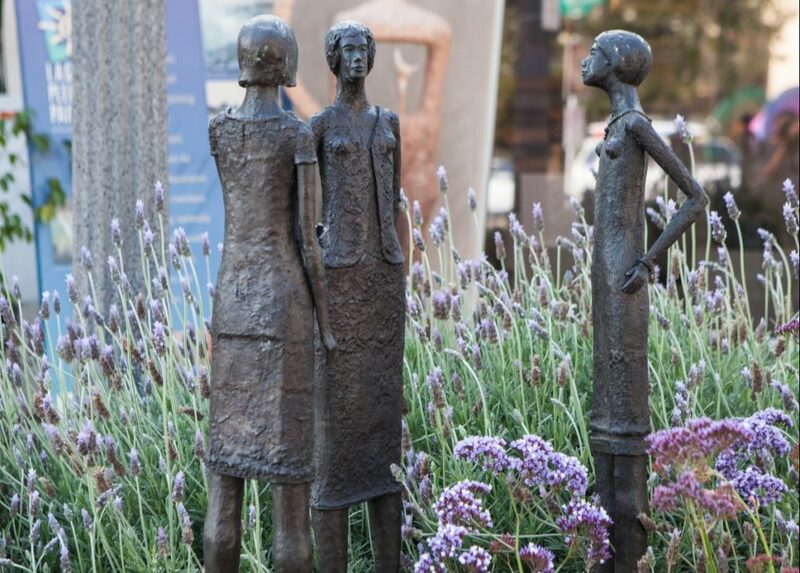 Also on the maintenance list in recent years: Ralph Tarzian’s The Discussion, a 2004 bronze sculpture that depicts three female figures facing toward each other, as if having a conversation. The piece stands at Forest and Ocean avenues and, although in overall good condition, it had accumulated a lot of bird droppings, which etched and stained the bronze. The caulking near the base plate of one figure was also poorly applied, and a plaque near the sculpture had become so dull and worn that its inscription was impossible to read. This work required a $750 fix, which included washing the bronze with a biodegradable detergent called Orvus WA Paste, treating the corrosion with a phosphoric acid gel and heating the surface of the piece with a propane torch to open up the material’s pores to allow a protective wax to really sink in. In north Laguna, Ekstrom’s bronze Deer Warrior, a mythological-type of creature that has antlers and carries a shield and long rod, has stood in Jahraus Park since 2000. The ocean air and coastal wind exposure caused rapid corrosion to the piece and surface staining; the intended dark brown patina was marred with green corrosion. Bird droppings also covered the sculpture and galvanic corrosion caused the bolts anchoring the piece at its base to rust. The treatment: $1,175 worth of pressure washing, phosphoric acid gel treatment and protective wax treatment. A UV clear coat was also applied to the plaque to protect it from the sun, and corroded nuts were removed from the bolts and replaced with stainless steel ones to stabilize the piece. Over at Heisler Park, a sculpture called Rendezvous, which features bronze figures of a man and a woman intertwined in a dancelike pose, also needed restoration. Located in a spot that gets full sun exposure, the piece—created by artist Tuan Nguyen and installed in 2008—is continually threatened by exposure to sun, wind, salty air and humidity, causing rapid corrosion staining including powdery blue corrosion “blooms,” runoff streaks and etching on the piece’s surface due to lots of bird droppings. The $2,575 treatment included pressure washing, UV protective wax and a chemical applied to hinder corrosion growth. [Left to right:] Temporary installation “Light Beam” by Sterobot stood in front of City Hall for eight weeks. “Nine Billion” by Douglas Turner turns heads. Bicycle Garden by Liz Avalon, added in 2016, is Lagunas first bike rack to double as an art sculpture. Laguna’s public art collection is not only continuously maintained, it is also being added to. Several new pieces have joined the scene in recent years. For example, “Nine Billion” by Douglas Turner is a temporary installation inside the British-style, red phone booth on Forest Avenue. The booth, filled with dummies wearing swimsuits, references the projected world population, which is anticipated to reach 9 billion by 2050. In addition to this art installation, which runs until at least fall 2018, the booth’s exterior was restored and painted, with funding from the city and lodging establishments in town. At the north end of Heisler Park, the Tide Pool Kraken, which is a bronze sculpture of an octopus on a rock, and Strand of Life bench were dedicated in 2017 by artist and lifeguard Casey Parlette; the pieces overlook Divers Cove and were donated by the Ostensen and Olenicoff families. The octopus, celebrating our local coastal ecology, is made of bronze sheets and rods that have been forged, hammered and welded, as well as nearly 800 bronze washers as the creature’s suction cups. The nearby bench’s bronze seatback looks like sea kelp, representing a family tree, while the limestone seat features the carving of a halibut in the sand. Another bench, Boom Boom Peal Step from Ocean Hill by Michael Stutz, was dedicated in February, at the Mountain Road beach access. Porterfield and another Laguna resident, Steve Chadima, funded the installation of this bench, which looks like interwoven metal ribbons and also features a rainbow, representing the community’s commitment to welcoming people from all walks of life. [It helps] to challenge people’s notion of what art is and what it can bring to a public space. To turn public space into something other than concrete and glass. … To turn the ordinary into the extraordinary. Benches aren’t the only practical pieces that count as public art. On Laguna Canyon Road, Liz Avalon’s Bicycle Garden became the city’s first bike rack to double as a sculpture when it was installed in 2016. Situated in front of the Sawdust Art & Craft Festival grounds, the metal racks look like whimsical flowers, welcoming visitors with their cheery, colorful appearance. Meanwhile, back in 2014, Terry Thornsley added the 3-D mural “Grace” near the new lifeguard headquarters building at Main Beach before he passed away. Made of metal sections, the scene shows various sea creatures and two people rowing a boat through blue-green waves. 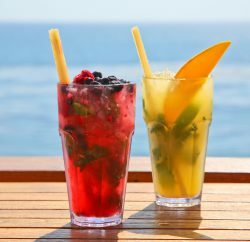 The next year, Sukhdev Dail’s Sea Breeze was chosen for the ocean side of the Inn at Laguna Beach. This intricate piece depicts a woman who looks as if she has just emerged from the ocean. Above her, the woman holds a headscarf that appears to be billowing in the wind, accented with colored pieces of plastic resin. Also in 2015, on Ocean Avenue at Beach Street, a piece called Road Blossoms popped up with several stools and a landscape planter, all topped with tile mosaics, offering a resting point for passersby. Two poles reach upward with colorful metal circles featuring cutouts of sea stars, urchins and anemones in this installation by lead artist Kyungmi Shin of Shin Gray Studio. And, just a few months ago, a large-scale temporary piece titled Light Beam by Stereobot—a team of artists, designers, engineers and architects—was installed outside of Laguna Beach City Hall. Illuminated at night with LED lights, the installation is a rainbow-colored coil, nearly as big as City Hall itself, and cost $26,900 to display for eight weeks, until March 10. Poeschl says she would like to see more temporary installations added around town that are large scale, and many local artists agree.